Microfluidics enables biotechnological processes to proceed on a scale (microns) at which physical processes such as osmotic movement, electrophoretic-motility and surface interactions become enhanced. At the microscale sample volumes and assay times are reduced, and procedural costs are lowered. The versatility of microfluidic devices allows interfacing with current methods and technologies. Microfluidics has been applied to DNA analysis methods and shown to accelerate DNA microarray assay hybridisation times. 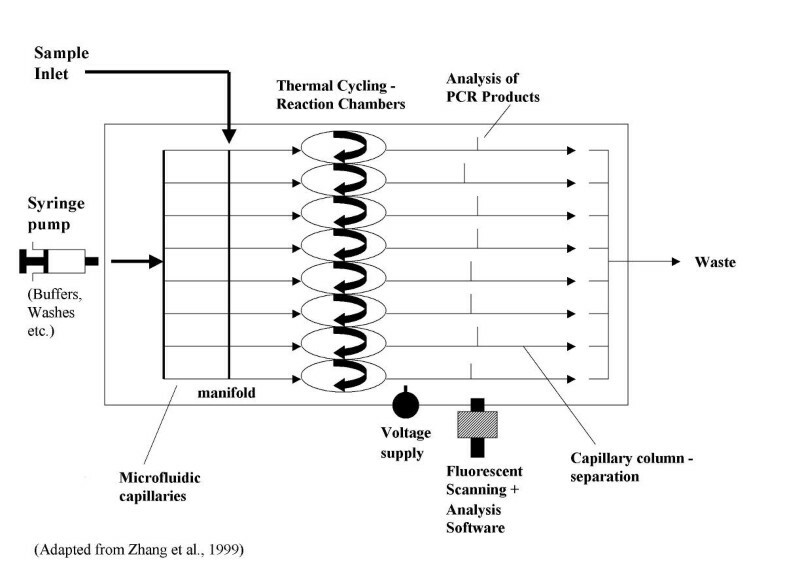 The linking of microfluidics to protein analysis techologies, e.g. mass spectrometry, enables picomole amounts of peptide to be analysed within a controlled micro-environment. The flexibility of microfluidics will facilitate its exploitation in assay development across multiple biotechnological disciplines. Current analytical techniques in biotechnology can potentially benefit from an integrated reduction in scale through lowered production and operating costs, and via the specific dynamics of flowing fluids occurring at the mico-scale, which enable the generation of accurate quantitative assays. Microfluidics combines multiple disciplines including biotechnology, microtechnology, physics, and analytical chemistry and has flourished as a research field. The processes involved in biotechnology and microfluidics technologies take place on a very small scale (microns to millimetres) where some physical processes can become enhanced, e.g. osmotic movement, electrophoretic motility and surface interactions. Microfluidics technology has essentially taken advantage of the inherent properties of liquids and gases at the microscale and combined this with semiconductor technology in order to build singular devices using a streamlined manufacturing process. In general, microfluidic devices can offer a number of advantages over more conventional systems, e.g. their compact size, disposable nature, increased utility and a prerequisite for reduced concentrations of sample reagents. Miniaturised assemblies can be designed to perform a wide range of tasks that range from detecting airborne toxins to analysing DNA and protein sequences. Therefore, microfluidics systems provide a real potential for improving the efficiency of techniques applied in drug discovery and diagnostics. In order for microfluidic technology to interface with, and provide improvements for, current assaying techniques it needs to be adaptable. Some commercial microfluidics systems illustrate their suitability to biotechnological applications. Typical devices include passive flow systems, such as the Passive Fluid Control (PFC™) micro fluid analysis system by BioMicro Systems http://www.biomicro.com. PFC incorporates 'building block-like' components into circuit designs in order to carry out sample processing, e.g. immobilisation, mixing, incubation. Essentially, PFC utilises hydrophobicity and 'passive valves' (a narrowing of capillaries) to control the movement of small volumes of fluids (< 1 µl) within a network of channels. Incorporation of active or passive pumps can also be used to control the movement of fluids in microfluidic systems, e.g. Nanostream's Snap-n-Flow™ system http://www.nanostream.com. Modules are 'snapped' together to construct a completely integrated and versatile system. A further setup by Gyros http://www.gyrosmicro.com has integrated a CD element with the movement and control of nanolitre volumes. When the CD is set spinning centrifugal forces are created allowing the device to be used to produce a controlled passage of samples through 'microfabricated units' on the surface of the CD. This technology can be applied to sample preparation for maldi-mass spectrometric analysis. Microfluidics systems capable of assaying 'unprocessed' biological samples, e.g. blood, have been developed therefore eliminating the requirement for sample preparation, e.g. Micronics http://www.micronics.net. Micronics' MicroFlow™ system can be used to extract analytes directly from whole blood and other particulate suspensions (5–200 µl volumes). The system utilises disposable 'lab cards', e.g. the ActiveH™ card can be used for sample preparation and isolation whereas the ActiveT™ card can be used in immunoassays. Some specific microfluidic systems have been developed that are capable of a range of DNA-type analyses. A microfluidic integrated system, which minimises sample processing and handling, has been developed for PCR analysis. Here DNA typing is achieved from whole blood samples using capillary microfluidics and capillary array electrophoresis , see Figure 1, whereby blood is used directly as the sample template for a PCR amplification analysis. Capillary flow direct PCR analysis. Whole blood samples are used for direct PCR analysis. Samples are manipulated within microfluidic channels. Microfluidics technology has also illustrated a potential to be allied with the detection of very low numbers of DNA molecules, i.e. potentially individual molecules. Foquet et al. have shown that the construction of fluidic channels of <1 µm enables the detection and relative proportions of mixtures of DNA molecules to be measured. In addition, using an electrical field to control the flow rates analysis times of only several milliseconds per DNA molecule become achievable. Electrophoretic mobility shift assays for the detection of DNA-protein interactions have also been carried out in a microfluidic chip environment . Some of the benefits achieved are reduced sample volumes, an avoidance of labelling procedures and decreased analysis times. The application of DNA microarrays revolutionised the analysis of gene expression studies. However, the technique generally relies on passive diffusion of the sample volume, containing the target analytes, towards the immobilised probe elements and this can result in long hybridisation times (normally hours). A method of accelerating the hybridisation time for DNA arrays using plastic microfluidic chips, comprising networks of microfluidics channels plus an integrated pump, have been developed . It has been shown that 'high initial hybridisation velocities' can be attained and that equilibrium, in terms of bound versus free analyte, is quickly achieved and so negates the requirement for such long hybridisation events. The assembly of arrays into microfluidic channels in order to improve the kinetics associated with hybridisation has also been shown by other researchers. A low-density array, generated within microfluidics channels, has been used to detect gene fragments (K-Ras) carrying a point mutation . Again it was found that microfluidics reduced the hybridisation time in this assay from hours, i.e. the time required in conventional static hybridisations, down to less than 1 minute. An alternative method of reducing array hybridisation times based on cavitation microstreaming has also been shown . Essentially cavitation microstreaming involves the use of a sound field to induce the vibration of air-bubbles (at a solid surface) present within a fluid. This ultimately causes a circulatory flow within the fluid and so mixing times become reduced from hours to seconds. Hybridisation signals and kinetics are also reported to increase by approximately 5-fold. Microfluidic technology has also been incorporated into the analysis of proteins / peptides [7, 8]. In particular, microfluidics can be linked with a mass spectrometric analysis of proteins or peptides. Thus, peptides can be adsorbed onto hydrophobic membranes, desalted, and through the use of microfluidics eluted in a controlled manner to allow the direct mass spectrometric analysis of picomole amounts of peptides by electrospray ionisation mass spectrometry procedures , Figure 2. Microfluidic mass spectrometric protein analysis. Proteins are applied directly to a membrane, desalted and directed by microfluidic channel to mass spectrometric analysis. The recently reported combinatorial peptidomics approach  is also perfectly suited for use with integrated microfluidic systems and in principle allows identification of tryptic peptides directly from the crude proteolytic digest. 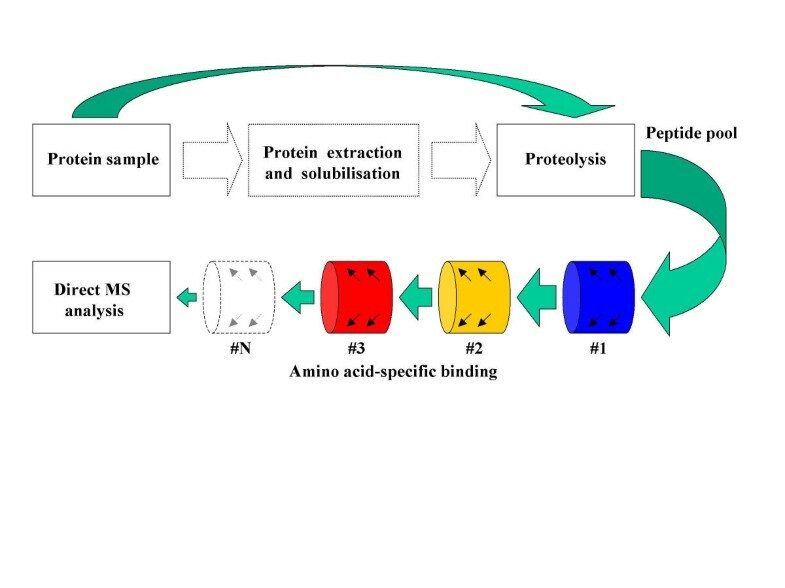 Combinatorial peptidomics initially utilises peptidomics where a protein sample is proteolytically digested prior to assaying, and combines it with a combinatorial depletion of the digest (peptide pool) by chemical cross-linking via amino acid side chains to allow a subsequent profiling of the resulting sample, Figure 3. Combinatorial peptidomics. 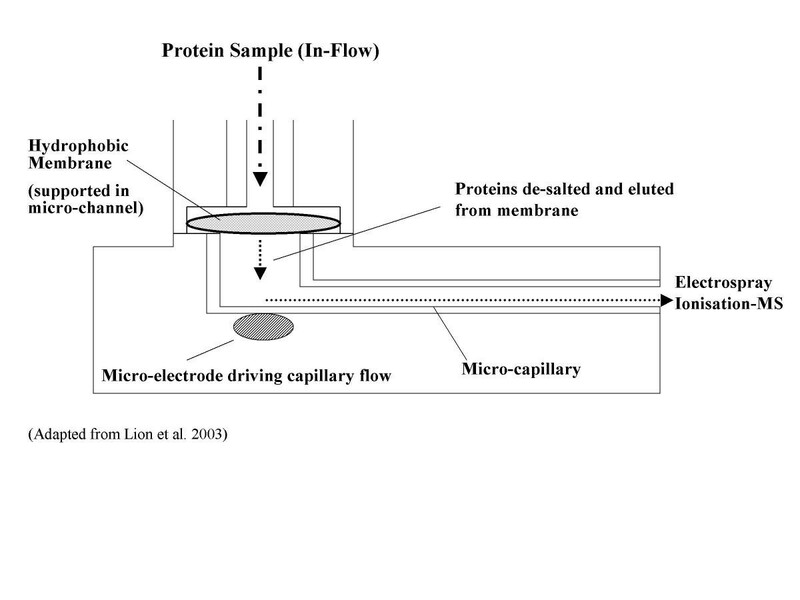 Sample solubilisation and protein purification are not necessary, since proteolyric digection may be carried on native cells/tissues (dashed lines). The amino acid filtering (depletion) step may be repeated using combinations of up to 6 amino acid "filters", i.e. chemically reactive surfaces (e.g. derivatised beads) able to covalently cross-link particular amino-acids. Chemical depletion reduces the complexity of the peptide pool to a sufficient degree to make it compatible with direct MS detection. Other protein analysis methods have utilised microfluidics channels linked to membranes imprinted with trypsin. This allows the amount of protein delivered to the membrane, the reaction temperature within the device and the reaction time to be directly controlled for optimal digestion . Thus, using microfluidics the sample can be supplied directly from upstream processing procedures, e.g. purification products from cell lysates. The peptide mixture can subsequently be analysed by electrospray ionisation mass spectrometry. Therefore, protein identification can be achieved in minutes using nanograms of sample. The development of protein microarray methods [12–14], analogous to DNA microarray technologies, for protein / peptide analysis has the potential to hasten the discovery of proteins of pharmacological value. As is the case with DNA microarrays it is important that sample volumes required for analysis are low, the sensitivity of the assay is high (particularly for low-abundance proteins), and hybridisation times are kept to a minimum in order to produce an efficient assay. A system incorporating protein microarrays, fluorescent detection and integrated microfluidics using planar waveguide technology has been developed . In combination these components enable quantitative measurements for protein profiling to be carried out with high sensitivity and also require shorter analysis times than static hybridisations. Finally, more novel uses for microfluidic technology at a cellular level include the handling of mammalian embryos , the manipulation of embryos and oocytes in assisted reproduction  and even the isolation of motile spermatozoa . It is evident that the inherent flexibility of microfluidic systems will allow them to permeate and advance the development of assays in multiple biological, chemical and physical disciplines. Thus, microfluidics should ultimately reduce the cost of running assays, decrease procedural times and limit the required concentration and hands-on manipulation of samples. RB acknowledges the support from the Research Strategy Fund, Royal Holloway Univesity of London.